London Stansted Airport, United Kingdom, 23rd February 2017 – SaxonAir is delighted to announce the addition of one of the most advanced super midsized business jets to its extensive fleet, after taking delivery of the brand-new Embraer Legacy 500, G-SUEJ. Powered by the state-of-the-art Rockwell Collins Pro Line Fusion avionics suite, the Legacy 500 is the first aircraft in its category to feature digital flight controls based on Fly-By-Wire technology. The system is further bolstered with graphical flight planning, auto brakes and Synthetic Vision. 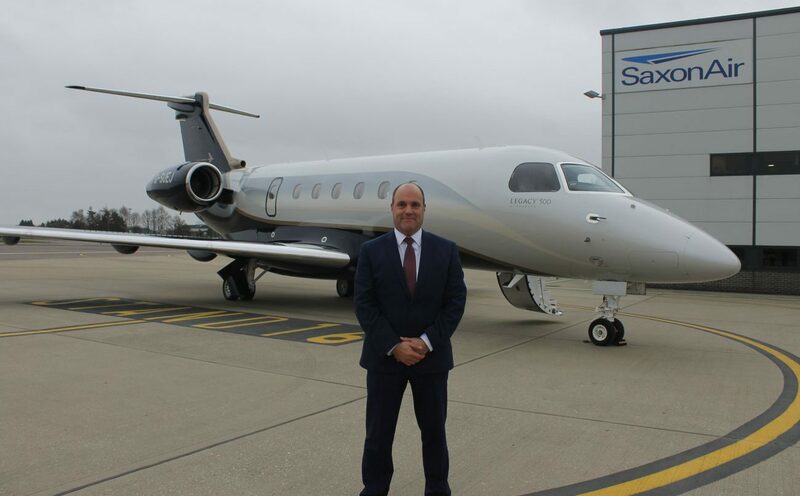 G-SUEJ is the first Legacy 500 to be based in London and SaxonAir chief executive officer, Alex Durand, believes that the aircraft’s class-leading performance and comfort qualities has established a luxurious niche for its customers departing from the nation’s capital. He said: “The Legacy 500’s capability to take-off from shorter airfields establishes a tremendous opportunity for our customers to travel from airports closer to their destination such as London City Airport, which is notoriously problematic for many other aircraft in its category to operate from. Passengers who travel on G-SUEJ will experience a fully-equipped wet galley and the latest in cabin connectivity – including WIFI, SatPhone and a high-definition inflight entertainment, displayed on multiple 19” full HD screens with individual touchscreen and wireless iPad/iPhone controls. The Legacy 500’s 6 ft. tall and 6 ft. 10 in. wide cabin is amongst the largest in its class and its 110 cubic feet of main baggage capacity, complemented by a generous inflight-accessible baggage compartment and cabin stowage space, enables travellers to carry additional luggage for longer journeys. “The addition of the Legacy 500 and its exceptional qualities to our already versatile fleet demonstrates our commitment and ability to deliver the most modern, advanced and luxurious experience for our customers,” continued Durand. “With its functionality to berth its six club seats and spacious divan into four beds for longer journeys, the Legacy 500 will deliver a complete solution to our customers. Additional to its impressive capabilities, the Legacy 500 wowed the aviation industry last November after it set a new benchmark for reaching continental and transoceanic routes in record time, thanks to its two Honeywell HTF7500E engines, the greenest in their class. To learn more about SaxonAir’s new Embraer Legacy 500, please visit www.saxonair.com/legacy500. SaxonAir’s new Embraer Legacy 500 can be booked for charter by contacting its dedicated sales team by telephone on +44 (0) 1603 518 118 or via email at charter@saxonair.com.